Van der Weyden belongs amongst the greatest artists of the 15th Century. However, not a single painting can be attributed to him with absolute certainty. Futhermore, there is no agreement over the chronology of his works. Van der Weyden most likely had many assistants in his Brussels studio, which makes attribution all the more difficult. Stylistically, he was tightly connected with his master instructor, the Master of Flémalle (Robert Campin), yet still his work has innovating qualities that had an enormous influence on other painters. He gave his works an emotional intensity, which makes it nearly impossible for the viewer to be left unmoved. He further developed a new reportoire of compositions that he often reused. Many other painters, also long after his death, took that repertoire over. His most influential works are The Descent from the Cross (Museo del Prado, Madrid), the Miraflores Altarpiece (Staatliche Museen, Berlin) and Christ on the Cross with the Virgin and Saint John (El Escorial, Madrid). Rogier van der Weyden is born as Rogier de le Pasture in Tournai. Rogier van der Weyden becomes a student under Robert Campin. Jacques Daret is also a student there. The two carry out projects together in their master's studio. The relationship among Robert Campin, Rogier van der Weyden and Jacques Daret is probably more of a collaborative nature, than that of a master and his pupils. The earliest works, recognisable as that by Van der Weyden's hand, are placed in this period. Rogier's father, Henry de le Pasture, dies. On 18 March 1426, the house is sold to Ernoul Caudiauwe, the husband of van der Weyden's sister, Jeanne. They remain together, living with the widow in the parental house. A document dated 17 November 1426 mentions "Maistre de le Pasture". Rogier van der Weyden must have thus already earned the title in Doornik. Rogier van der Weyden marries Liesbeth Goffaert. Van der Weyden receives a gift from the city administration of Tournai, probably for the birth of his first child. A document mentions the official register of Van der Weyden as student with Robert Campin. On October18, Jan van Eyck, then the court painter of Philip the Good, is invited by the painters of Tournai on the ocassion of St. Luke's day. There is probably contact between the two painters on this ocassion. Jan van Eyck visits Tournai for a second time. The reason for his visit is not known. Philip the Good marries Isabella of Portugal and and is named the heir of the dukedom from Brabant and Limburg that he added to Burgundy. On 5 October, Philip the Good is inaugurated as the 28th duke of Brabant. On 8 October, the new duke enters the palace at Coudenberg. Brussels becomes the administrative capital of the Burgundian realm and the seat of the court from that time onwards. On 30 July Campin is banned because of adultery. His studio is shut down. On 1 August, Van der Weyden purchases freemaster status and becomes independent. Birth of Van der Weyden's second child, Margareta. Van der Weyden remains active in Tournai and among other things, works on the embellishment works of the Saint Margareta Church. On 21 October, Van der Weyden is mentioned in the Tournai rental legers as "demorant a Brouxielles". From this year forward, Rogier van der Weyden is in service as a painter of the city of Brussels, a function that is created especially for him. In the first place, he is tapped for the execution of four justicel panels for the "Gulden Kamer" (Gold Room) of the Town Hall. Van der Weyden paints The Descent from the Cross (Museo del Prado, Madrid) on assignment from the Leuven marksmen guild for the Our Blessed Lady of Ginderbuiten Church. Van der Weyden paints Saint Luke drawing the Virgin (Museum of Fine Arts, Boston) as altarpiece for a painter's corporation, probably from Brussels. A 15th-century copy of the paintings is found in the Groeninge Museum in Bruges. A rereference in the city documents emphasises the singularity of the appointment of a city painter: "after Master Rogier, no other painter shall be appointed." Among the commissioners of Rogier van der Weyden is Philip the Good and prominent members of the courts such as Nicolas Rolin and Jean Chevrot. Van der Weyden paints one of the official portraits of Philip the Good. Two copies of this painting are found in the Royal Museum of Fine Arts in Antwerp and in the Groeninge Museum. Official start of the first justice panel for the Brussels Town Hall. (Legend of Trajan and Herkenbald) The panel bears the Latin inscription: "Rogerius (S)weidenus civis pinxit 1439". The work on these panels presumably runs through circa 1450. The panels were destroyed in 1695 in a fire as a consequence of the bombardment of Brussels. A wall tapestry based on the painting of circa 1450 is to be found in the History Museum in Bern. Van der Weyden's third and fourth child, Pieter and Jan, are born. Van der Weyden is mentioned as polychromer of a stone memorial table of the dukes and duchesses of Brabant and Gelre in the church of the minor brothers in Brussels. This is an assignment of Philip the Good. Van der Weyden purchases a house on the corner of the Magdalenastraat and the Cantersteen in Brussels. Painters group their studios in the area. Robert Campin presumably dies on 26 April. Van der Weyden paints the large Polyptych of the Last Judgment (Musée de l'Hôtel Dieu, Beaune) on assignment from chancellor Nicolas Rolin. 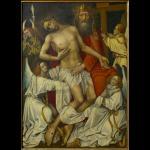 The work is intended to be in his hospital established in 1443 in Beaune. Presumably Rolin wanted the polyptych to surpass the Ghent Altarpiece of the Van Eycks in size and grandeur. Van der Weyden illuminates Les Chroniques de Hainaut, a manuscript translated from Latin into French by the writer Jean Wauquelin. The assignment comes from Philip the Good. This is the only known work of Van der Weyden in tempera on parchment. Rogier van der Weyden is named the "city painter of the city of Brussels",' which means that he is simultaneously painter and tableaux maker. Pope Nicolas V declares this year "Holy Year". Van der Weyden travels to Rome. Facius (De viris illustribus, 1456) mentions that upon seeing the now-lost frescoes of Gentile da Fabriano, Rogier van der Weyden praised him as the best painter in Italy. Rogier van der Weyden's visit to Italy must have been an important event amongst the artistic circles. He was probably received and escorted there with great honour, and he travelled to all of the great artistic centres. On 15 August Lionello d'Este has a payment made for paintings by Van der Weyden for his "studiolo". Van der Weyden's daughter Margareta dies. Van der Weyden paints the Altarpiece of the seven Sacraments (Royal Museum of Fine Arts, Antwerp) for Jean Chevrot, bishop of Tournai and an influential member of the Burgundian court. Probable start period of Christ on the Cross with the Virgin and Saint John (El Escorial, Madrid). This painting is a gift of the painter to the Carthusian cloister of Scheut. It was delivered in 1456. Van der Weyden works, on assignment by the Abbot Jean Robert, on a triptych, among other things, for the main altar of the St. Aubert in Cambrai. The triptych is delivered in 1459. The work has not been preserved. In this period, he also works as a polychromer of sculptures for the burial tomb of Joanna of Brabant. From the 1450s onwards, Van der Weyden also becomes famous as a portraitist. Between 1455 and 1460, he paints the Portrait of Philippe de Croy (Royal Museum of Fine Arts, Antwerp). Philippe de Croy was appointed governor of Henegouwen in 1456. The portrait is probably the right panel of a diptych and belongs to the Virgin and Child (Henry E. Huntington Library and Art Gallery, California). In the same period, he paints the Portrait of Francesco d'Este (Metropolitan Museum of Art, New York), member of the court of Ferrara, and a Portrait of a lady (National Gallery of Art, Washington D.C.). In his Trattato d'Architettura, Antonio Averlino (Il Filarete) calls Rogier van der Weyden one of the most competent living painters qualified for the decoration of the ideal palace of the prince. 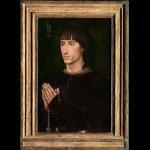 Van der Weyden paints the Portrait of Charles the Bold as a twenty-one year old. (Gemäldegalerie, Berlin) This painting is probably the only portrait that was accepted by Charles the Bold. 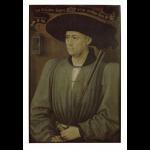 Rogier van der Weyden dies on 8 June at the age of about 64. He was buried in the chapel of St. Catharine in St. Goedele in Brussels. In his Schilder-Boeck (Painter-Book) Carel van Mander describes Rogier Van der Weyden as a painter who optimised the art of painting: "both in presentation and order with a portrayal of inner human desires and affections". Bibliographical references can be found on the website of the Study Centre for Flemish Primitives.